I pulled back the curtains and thought wow! 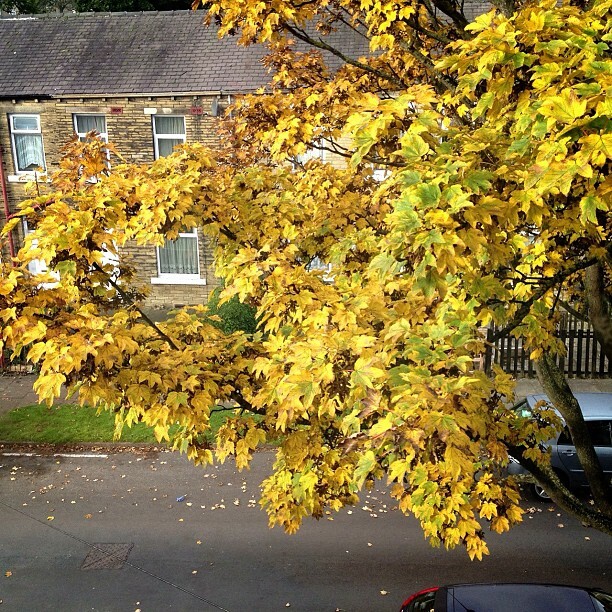 The sun was shinning so brightly but the tree right outside my window looked amazing with all the Autumn colours, it really made me smile and started my day in such a positive way. I really need to start using my camera again to capture moments as my phone isn't always ideal when I needed to zoom in etc... but its just so convenient. I can't remember the last time we experienced Autumn as usually we go from Summer straight in to Winter so its weird to have the Spring like weather (cold morning/nights and warm day times with rainy days in between) but with amazing colours all around. I could get used to the weather being like this and skipping winter all together as its just right for me. Its weird to think that people at work were shouting about snow storms in early October but then they said the same last year and we had a heatwave instead. Today I went to the post office and then the post office sorting office. The postman had left a card to say there were two packages which I assumed were for both my brothers but was the one who ended up going down as they only used initials... it was such a surprise to find that one of them was for me from a friend containing labels I asked her to make me and craft supplies as well as some other bits and pieces. My friends sure know how to spoil me :). From there I went to M&S and oh my! I could really have bought a lot of clothes from there as they had some gorgeous Cardigans, Jumpers and Coats but I have to admit I loved a lot of the English styled clothes but I don't know if I will ever go back to wearing them now as I haven't worn English clothes since leaving college. Bradford's M&S is nasty, its the store you would go to if you were shopping for your gran but to be honest all the grandmothers I know dress trendy so even they wouldn't buy from there. When people told me how great M&S was I just thought they were mad and it was just an over hyped store due to the crappy one we have here. Also at work they gave £50 (now £75) vouchers when a member of staff has 100% attendance every term and I didn't want it as I didn't know what I'd buy there. My sister told me if I gave it away she'd chop my hands off as she loves the childrens range there... saying that though today it wasn't all that good. This M&S is between Leeds and Bradford and is known as the OwlCotes Centre (M&S and Asda). I also went to the supermarket, Staples and then to my aunties before coming home and ordering a take away.... so it has been such a relaxing day. Tomorrow though I've told my younger brother he's taking me to the White Rose Centre in Leeds as I really need a winter coat with a hat for work as I do lunch duty every day so would appreciate something warmer even though work have provided up with jackets but they just aren't appropriate for the winter weather. Hopefully I'll find something as I haven't had any luck here. I love the Autumn leaves! We have Virginia Creeper that almost covers our whole house and it is just turning a beautiful red colour at the moment. I love the colours of Autumn. As for going to shops, well, it is very rare that I leave my house being agoraphobic, so all of my shopping is done on-line...which I can often pick up some great bargains, plus because I love my own style, I often adapt to my taste. This week-end we have started our Christmas shopping...or at least making lists. I agree its easir to shop online but with clothes I dare not as I just have a weird figure that things just look weird on me. I'm glad you like the photo as I didn't think my camera phone did it justice. I'm convinced there is a heart there in the big space so maybe its why I felt the love more :D. It looked just as beautiful this morning which is why its a shame that tomorrow I'll get up when its dark again :(. We normally go straight from summer to winter as well, but this year we have had a long and wonderful autumn. Joy! I agree its such a joy to have weather like this and keeps reminding me that there are some good things going on too. It snowed last night...and everyone drove this morning as if there was two feet of ice on the road. I'm hoping people start to remember winter driving sooner rather than later :/ Glad I have a short week this week! Oh Goodness I just don't even want to think about it snowing just yet but I know what you mean as everything runs at a snail speed. The problem also is that more people end up taking there cars out as I find they do that when it rains even if its just to the end of the street which of course doesn't help. I've only one more day to get through.